The developer at 3303 BROADWAY (formerly known as the People’s Clinic) has submitted applications for a Site Review for the development and a Rezoning to rezone the property from Public (P) to Residential – High 2 (RH-2). Municipal Building at 1777 Broadway starting at 5 p.m. Better Boulder recently had the opportunity to review the proposal for 3303 Broadway. Our review and evaluation of the project is included below. When reviewing projects, we have a 6-category review template with specific criteria and a scoring metric, which we will also explain in this post. These criteria are how we will review projects moving forward. Each category is given a score from 1-5. The average for a Boulder project is a 3, with scores higher than a 3 being better than average. Since not all categories are applicable to every project (for example, residential or commercial only projects), the score is then normalized into a final grade ranging from 1-100. A 50 is an average Boulder project. Better Boulder will endorse projects only if they have scores higher than average. Holiday grades out in the mid 80s and Steel Yards in the mid 90s. More recently, projects such as S*Park and Commons score in the high 90s and close to 100, respectively. A measure of how the project encourages multi-modal transportation options, , locates parking away from the street and/or underground, implements TDM strategies including unbundled parking, and reduces area dedicated to off-street parking and pavement. A metric based on how effective the project is in providing additional, diverse, effective and non-traditional housing options for owners and renters, providing housing in underserved areas and underserved population segments, and providing affordable housing. A measure of how well the project creates a sense of energy, enhances activity and engagement of its users and the surrounding context, encourages walking, and provides a mix of uses. This includes the design quality, especially of the first level as it engages the street and forms the public realm. Better Boulder graded 3303 Broadway as follows, with very brief notes about each score. In all cases 3303 scored at or better than the average score of 3, which is indicative of a well-conceived project. 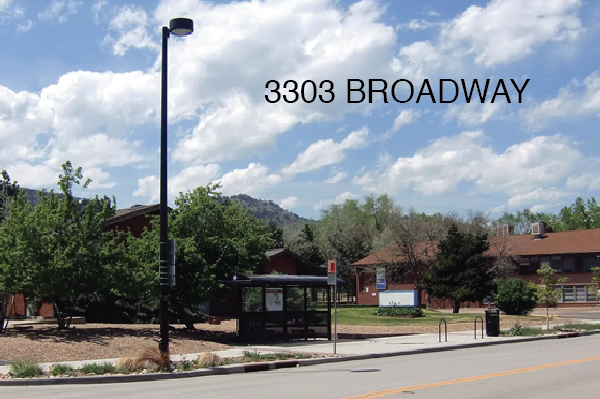 The normalized grade out of 100 is a 77, which solidifies 3303 Broadway as a strong project, one that Boulder should seek to add to its civic fabric. Based on this review, we feel this project provides a strong opportunity to create much needed housing and housing diversity, augment the built environment, begin to address the issues at the Broadway corridor and introduce commercial back into the neighborhood. Better Boulder supports 3303 Broadway. If, during the review, there are opportunities to address any of the above identified possibilities, we would support that exploration. However, in its current form, we recommend its approval.